Diabetic peripheral neuropathy with pain, and numb feet and toes could be the result of an entrapment like carpal tunnel and hence potentially treatable. However considerable controversy follows it. 1) Carpal tunnel entrapment is now thought to be a tendonopathy induced disease (one current approach is to actually strip down the swollen tendons as a treatment). 2) Response to carpal tunnel surgery has very little to do with the delineated nerve conduction entrapment found, suggesting it is more the nerve irritation from the tendonitis that is key. Concannon, Matthew J. M.D. ; Gainor, Barry M.D. ; Petroski, Gregory F. M.S. ; Puckett, Charles L.
3) The feet are something you stand on versus the hands so the foot tarsal tunnel sydrome would be a totally different animal from carpal tunnel. There are “experts” out there that pretend that tarsal tunnel syndrome in diabetic peripheral neuropathy rarely exists. Yet there is a growing list of studies showing foot/ankle tarsal tunnel release surgery helps Diabetic numbness and helps prevent leg ulcers. It is entrapment around the ankle similar to carpal tunnel. There are metabolic changes that occur in Diabetics(DM) that predispose to entrapment – much like seen in the increased incidence of carpal tunnel in DM patients. Pressing the area in question should be sore (from the tendonitis). – just behind and below the medial ankle bump. It would be very nice if you could also elicit a tingling down in to the foot/ankle when pressing – something called the tinel’s sign. 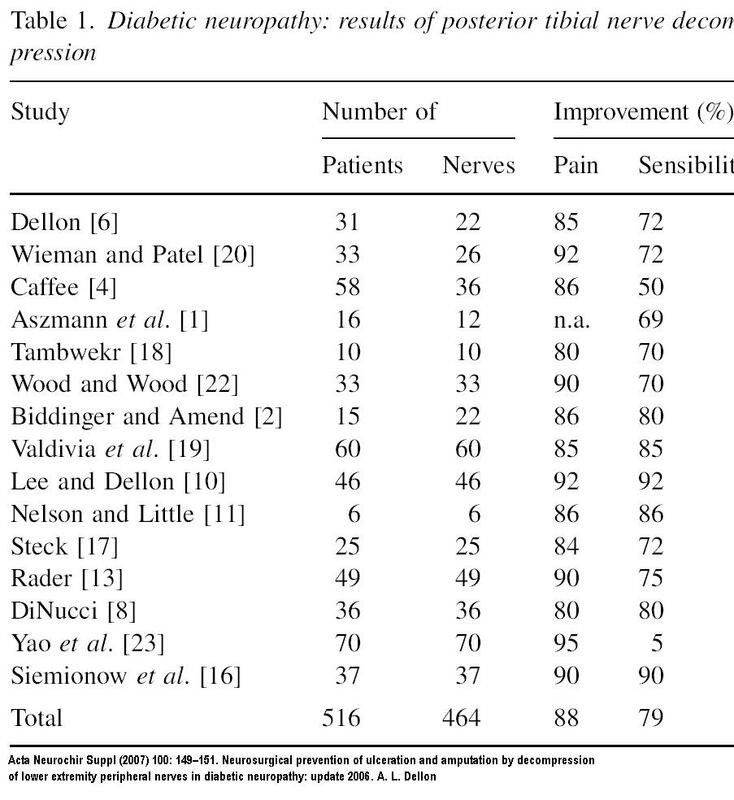 What this analysis showed was that pain improved by 88% and sensation improved 79%. With the age of evidence based medicine (gag) people have decided to ignore overwhelming evidence because a randomized control trial has not been done. Cochrane Database Syst Rev. 2008 Jul 16;(3):CD006152. Decompressive surgery of lower limbs for symmetrical diabetic peripheral neuropathy. Doctors rarely even mention this form of treatment. Basically states that only 5-22% of doctors aware surgery might help. Comment – Innocently, I came across a recent Turkish article describing favorable results of decompression surgery. 1 year ago. I mentioned this to the Neuropathic Pain Group – Canadian Pain Society 2008 meeting in Victoria, BC – when they found the article was from Turkey, the whole issue itself was ignored and I was literally laughed away. Yesterday, I was at a talk on diabetic neuropathy, and the issue of entrapment was received with groans. The neurologist was nice enough to mention he sends people for steroid injection of the tarsal tunnel as a diagnostic technique and takes it from there. 1) Find where tinel’s sign is and go 2 cm proximal. Aim distal – 30 degrees to skin. inject superfically and laterally to nerve where tibialis posterior is. Use 3-6 mls with 40 mg kenalog and local. 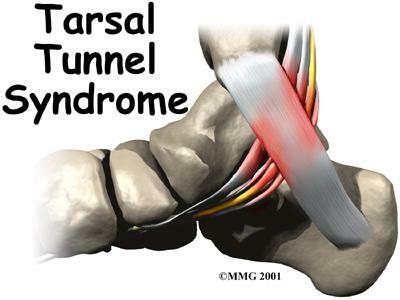 In my town, I have never heard of anyone having tarsal tunnel surgery. My personal feelings is that there are a lot of block heads out there that ignore the fact that chronic pain causes considerable peripheral sensitization and that produces multiple pain generators. -consider that there may be local problems that are aggravating it; a bone scan might highlight that. If circulation is an issue, then an angioplasty (stent) might help. “Two examples of ‘cuboid syndrome’ with active bone pathology: Why did manual therapy help.” Mark Lewis et al. Manual Therapy 19 (2014) 494-498. – Near daily shots of B12 – my daughter and I poster published results of it for pain and found about a 20%+ reduction in pain – it augments gabapentin/lyrica too. Oral B12 can give some results but took much longer.